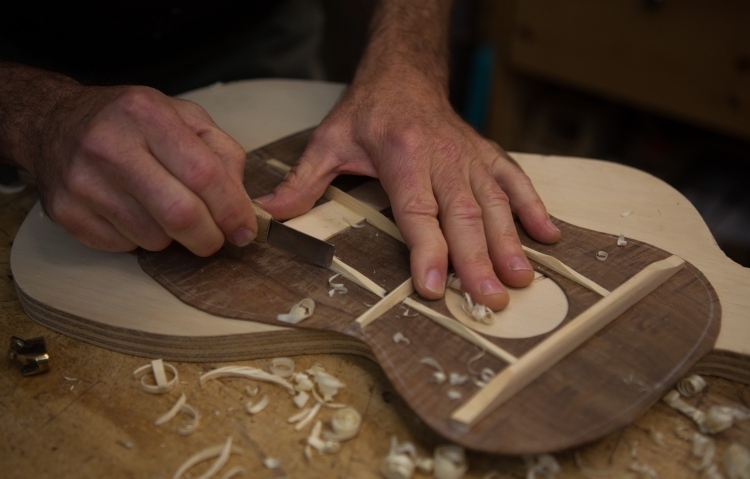 Building and teaching from his workshop in North Carolina, luthier Jay Lichty tells us about his path to ukulele building for a living. Discussing some of the alternative and limited tools he used in the early days and the results he turned out with these resources. Through his career change, to his now international reaching business of hand-made, custom guitars and ukuleles. I have played music for most of my adult life, well ever since high school. Although I was pretty good I was not great, so when I could afford it I always bought custom instruments. My thinking was that I needed all the help and confidence I could get, so that when I played something… good or bad… at least the instrument sounded great. Then along comes my first ukulele, it was a factory baritone, but I fell in love. I quickly bought a tenor and then, all of a sudden I was hooked and came down with a bad (or good) case of Ukulele Acquisition Syndrome (UAS). You all know it, you all likely have it… it is very contagious! Soon enough I wanted a custom uke but was still too new to the instrument (or so I thought) to take the plunge and buy one, so I tried my hand at building one. Those first ukulele builds were done with the carpentry tools I had on hand from my construction livelihood. I built them in the garage… yes with no humidity control… using whatever wood I could find. They turned out pretty darn good, although the lack of humidity control made them subject to swelling and shrinking a bit. But I was hooked all the same! Early on the choices were about wood sourcing and tool needs – I have always been the type of person to use the tools at hand if they work for the task. It is amazing how few tools one really needs to build a ukulele. That first ukulele was built using information I gleaned by watching a YouTube video. The builder started out the video by going to his wood pile… this is a firewood pile by the way, you know, outside in the elements. Seriously I’m talking chopped and split firewood! He picks out a piece, brings it into his workshop (really a shed), brushes off the bugs and cobwebs and proceeds to whittle it down for the back and sides. He also goes to his local lumber yard and picks out a spruce 2X6 from the stack of framing and that becomes his ukulele top. I don’t recall what he used for the neck and fingerboard but I remember it was all stuff you could find around the yard…and I don’t mean lumber yard, I mean outside in the yard. I continue watching because now I am fascinated. He has a skill saw (circular saw), a belt sander and a regular corded hand drill. That is the extent of his tools. With this concoction of wood and small selection of tools (that I happened to have myself) he proceeds to build an ukulele. He gets all the way to the finished build and from the shelf pulls down three spools of strimmer twine which he then proceeds to use for the strings. Okay so you can guess what that ukulele sounded like. Yes, a piece of firewood with strimmer twine. But now I see that I have everything on hand to build a ukulele. The need for better and more tools does come into play later though, when production and consistent quality become the focus. I read what I could find and watched a ton of YouTube videos. Nothing seemed as important as learning this craft. I eventually took a guitar building workshop with Wayne Henderson and built my first guitar. I learned some very important building techniques and found it extremely motivational, it was like putting rocket fuel in a drag racer. Each instrument was better than the last… as it should be I suppose. I could not get enough of the process, so I quickly became obsessed with the details and the quest for the perfect instrument! The economic down-turn is what actually drove me into building instruments full-time. My home building business, a business that had never failed to keep me gainfully employed, suddenly dried up. Since I had free time, I started building more and more guitars and ukuleles. I was really just making busy until the home building picked back up (which it never did). At some point early on, the phone, which had quit ringing for my home building business, started ringing for ukulele and guitar orders. So I hung up my home building tool belt and replaced it with my luthier’s hat. Lichty Guitars and Ukuleles is a two person operation, with me in the shop and Corrie Woods (my wife) behind the camera and computer. This is such a cool job because the results are tangible on so many levels. I love to build, I love to play, I love the details, I love working with wood… and I love hearing from our customers. Especially hearing them play the instruments I’ve built! Through Corrie’s marketing and photography skills, which she developed along this ukulele and guitar journey, our instruments have become global. Business is unbelievably good and the future looks fun. One of the things I enjoy is teaching. I offer building workshops for both guitar and ukulele. These are either done as a group of three or four students who each build their own instrument over a 10-12 day period, or as a one on one session. Both have become very popular. I (like most of my brother and sister builders) am always seeking out that new instrument. I have a constant itch for improvement in my craft. 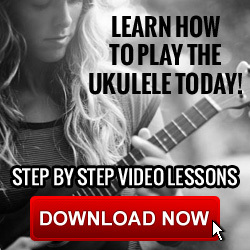 I am encouraged with the direction ukulele is heading. The skill level of the players is really stepping up the game and that is great for the builders. The ukulele community is expanding, with some really sophisticated music played in some big venues. I started building ukuleles because I wanted to play a real instrument… not a toy. I see that becoming the norm for players. That is going to help the small luthiers like us, who cater to just that goal. 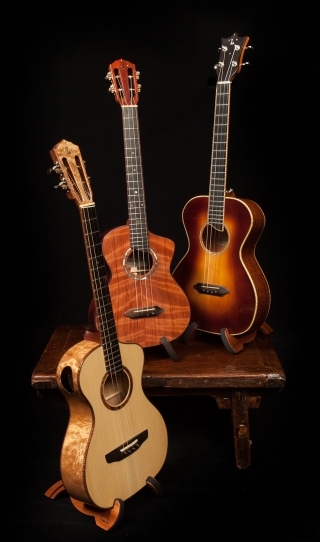 This entry was posted in DIY Ukulele, Ukulele Interview, Ukulele Luthiery and tagged Professional Luthier Interview, ukulele, Ukulele luthiery.